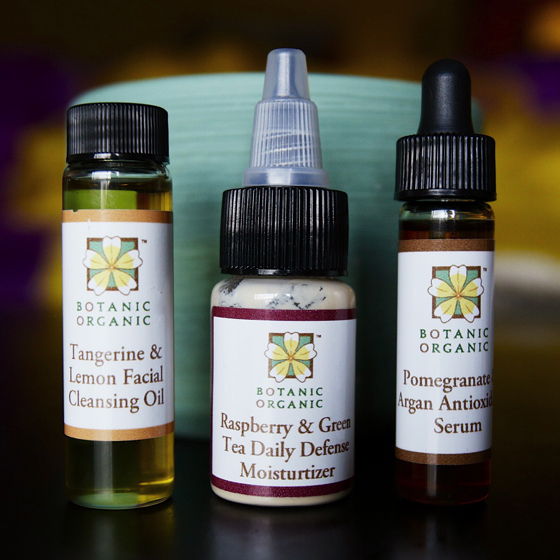 Nancy Newsom, founder of Botanic Organic natural skincare, embodies what “unsullied” is all about: she changed her diet to make more conscious, organic choices, and soon after…examined what she was putting on her skin. Was it chock full of irritating ingredients and harmful additives? The answer was yes. We feel you, Nancy. She decided to take the ultimate step toward positive change and start an organic skincare line, after plenty of research on natural ingredients that would cleanse, moisturize and treat. Nancy used her own formulations to diminish the appearance of sun damage on her face (dark spots) and her skin became softer and more nourished. Her empowering attitude and positive outlook on healthy choices really inspires us. Plus, her products pack a seriously effective punch, the ingredient aromas will make you feel like you’re at the spa, and the product sizes are generous: often two or three times the size of what you get at a typical green beauty boutique. She graciously sent me some samples that I want to tell you all about!